​Tuition: = $35/class, payable by the semester ($490, or two payments of $245). Young Beginners: minimum age 8 (younger students begin with private lessons). Up through one year playing experience. Intermediate: all ages; already familiar with the bass and music concepts. Most students will be 5th - 9th grade in school, but others at this level are most welcome. Advanced: those at the level of playing 3-octave scales and beyond. ​Adult learners: beginning level - learn proper core technique that applies to all styles of music! As you progress, arco/classical players join the intermediate class. Small group classes (max group size: 6) are a highly effective and fun way for bassists from all studios and backgrounds to rapidly improve their technique. It's well-known that a small group environment is a powerful asset to learning, as participants learn from watching each other and gain from the environment of peer support. Private lessons can be scheduled directly with the teacher with whom you are interested in studying. We also refer students to other excellent teachers we know. There are no commissions or fees to any party; referrals are entirely based on matching students with the most highly qualified private teachers for the benefit of the progress of the student. Effective Instruction: In our short six years of offering bass technique programs, our group class and private students have passed their auditions to: Oberlin Conservatory, Ithaca College, Northwestern University, Baylor University, The Houston Youth Symphony, Virtuosi of Houston, Domaine Forget Academy, the International Society of Bassists Solo Competition Semi-Finals, Texas Region and All-State Orchestras, the High School for the Performing and Visual Arts, Interlochen, Sewanee, and several other advanced programs. Our students have been accepted as music majors to The New School, Baylor University, Ithaca College, Oberlin Conservatory, University of Louisville, University of Houston, and Northwestern University (so far)! Thomas Helton was with us August 17 2013, performing "Incarnations" by Hsin-Jung Tsai (with the composer in attendance), and answering questions about expanded techniques and free improv from the Summer Semester students. Thomas is one of Houston's busiest jazz bassists, and also excels at orchestral and new music performance. Thanks, Thomas! We were honored and delighted to host Dr. Sandor Ostlund of Baylor University for our spring semester special guest March 9, 2013! 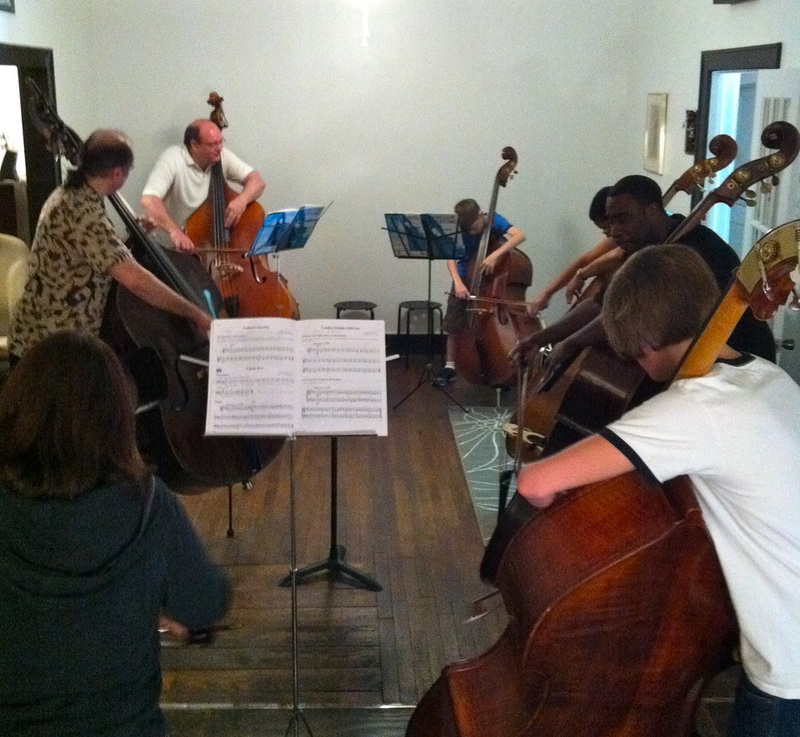 We were honored to host Tim Pitts, principal emeritus of the Houston Symphony and professor of double bass at Rice, to lead a master class for the QBC program students in the fall 2012 semester. He's from Houston. He's learned stuff that practically no one else knows. And he's here to show it to you! Matt Kline is a recent graduate of Dr. Sandor Ostlund's renowned studio at Baylor University, as well as L'Institut International Rabbath in Paris, and is currently pursuing graduate studies with new-music expert Mark Dresser in San Diego. Matt shared a unique performance and demonstration of his intensive study of expanded double bass techniques, including those pioneered by bassist/composer Stefano Scodanibbio and utilized in Matt's recent work with Krysztof Penderecki. The future of double bass technique includes these highly technical studies, and we greatly appreciated this unique opportunity to see Matt's frankly amazing accomplishments. We are extremely pleased and excited to have been the host and sponsor of the appearance of Caroline Emery at the 2013 TMEA convention, and of this special workshop with this leading expert in young bassist pedagogy. Caroline Emery is Professor at the Royal College of Music, Eaton College, and Yehudi Menuhin School, and the author of Bass is Best, a beginning bass method book series. With close ties to Houston's large early-music community, Quantum Bass Center is known as a resource for instruments and bows for period performance styles. We were able to set up a hands-on display of a 6-string violone and modern basses strung with baroque-style gut strings, gut orchestral strings, and synthetic-gut strings, along with a large number of period bows. Professor Dunham graciously brought along her original Viennese 5-string and beautiful Christian Laborie violone. Both the young students and adult guests were able to try this very unique collection, hear Professor Dunham's discussion, and perform for her in a master class setting!